Mineral Trioxide Aggregate (MTA) is a great material for retrofills, root perforation repair, direct pulp capping, apexification & apexogenesis. This material is mostly used by specialists, under a microscope. However, new applications, such as direct pulp capping, will make this material more commonplace. 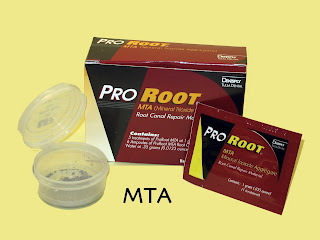 Unlike most dental materials, MTA requires moisture to set up. 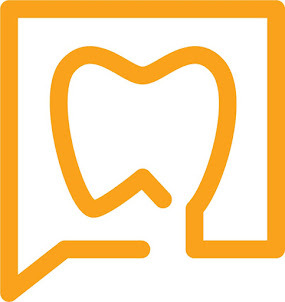 Since moisture control is one of the largest challenges in working with most dental materials, this actually is a positive characteristic of this material. Using this material is like playing with wet sand. You can add or remove water to the consistency that you like. If you put too much water in it, it runs. If you put too little water in it or it dries out, it crumbles. If you put just the right amount of water in it, it becomes packable, just like wet sand. It takes a little practice, but once you learn how to manage the moisture, it's great to work with. The material does dry out while you use it, so additional water can be added to return it to your desired consistancy. There are few specialized instrument that aid in the placement of MTA. Carriers are made in all shapes and sizes. These work just like an amalgam carrier on a much smaller scale. Another useful carrier is made from a plastic block and a simple hand instrument. Handling MTA will take a little practice, but once you learn how to mix and handle it, you will find it is a great material to work with. The following video clip shows the placement of MTA as a retrofill during an apicoectomy surgery. Do you use any special instrument when you have to repair a strip perforation? 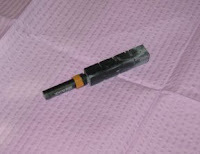 I have repaired the furcal perforation with the aid of the endogun (Maillefer). I couldn´t repair the strip in MB canal because bleeding and supuration. I can perfectly see the defect in the internal wall of MB canal but I´m afraid I could block the canal if I place MTA before obturation. What would you do? Thank you very much. Again your blog is really interesting, I´m learning a lot. Javier Pascual from Spain. 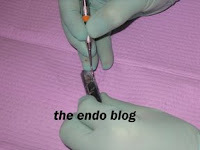 I generally try to get bleeding stopped so that I can obturate first and then repair second. In your situation, if I could not get the bleeding stopped, I might try some astringadent or a little Ca(OH)2 to stop the bleeding. Another trick would be to instrument the canal, place a GP cone or paper point to do the repair (let the material completely set up), and then go back and remove the cone/point and obturate the canal. I´m shocked!! 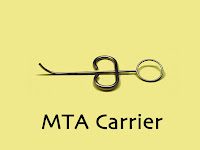 I have just ordered the MTA Block. 100 euros for a little piece of plastic!! As I look closer to your video, that show a root fracture? Yes, that is correct. 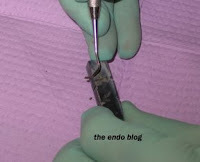 After I had placed the retrofill, I noticed the vertical root fracture and the root had to be removed. Since I got such a good image of the MTA placement, I went ahead and posted the video. Nice evaluation. The pattern of bone loss also should have clued me into the fracture sooner. Placement to precision..lot to learn from the video. Kriti from India. I was recently at a lecture by John West. He recommended trashing calcium hydroxide as a capping material and using strictly MTA. Do you recommend this even for indirect pulp caps? I am using very little Ca(OH)2. I prefer MTA if I have to do a pulp cap. Direct or Indirect.